Weekly hobbit gathering at the Green Dragon inn in Bywater, running ever since May 18 2008. This is an event for and by hobbits, although a few visiting traveling dwarves are always welcome. It is also a 100% in-character event, so don’t go talking about things not belonging in Middle Earth! 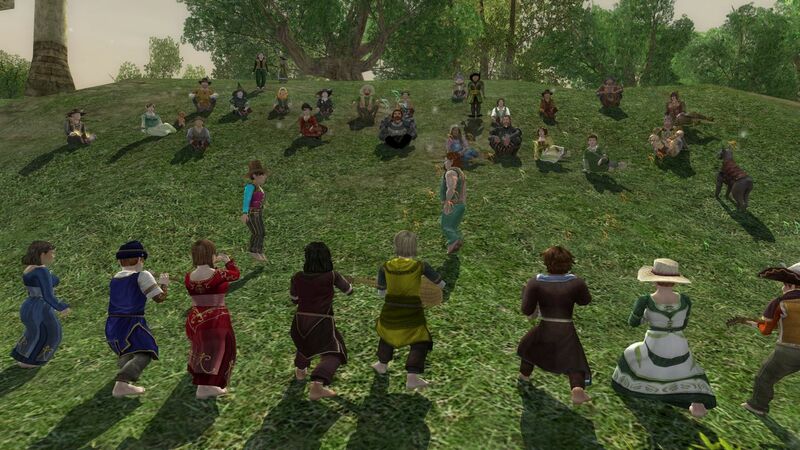 Come along for songs, dances, poetry, tales, riddles, news and much grand roleplaying! And do offer yer own entertainment, if yer like! Sometimes, we’ll run “Lone Bard Fridays”, where we only allow solo or duo performances. This is to limit the impact of big bands at the Dragon, and allow newcomer performers a chance to show their skills. At other times over the year, GDF will move to other inns in the Shire. The new years party is usually held at the Plough and Stars in Brockenborings, while we always escape Bywater when the mayor hosts the Farmer’s faire in the late summer. Be in-character – be a hobbit! Keep player interactions (chats, emotes) and entertainment in-character, basically by talking about the things that hobbits in Middle-Earth would. Don’t discuss real-life modern-day things, game mechanics, etc. Avoid using forced emotes, setting off fireworks inside, bringing pets that wouldn’t belong in an inn, throwing 3000 snowballs, etc. Be active and engage with the others. It is better to participate than to just stand around waiting for others to entertain you (however, feel free to come observe things the first few times). Avoid multi-boxing with lots of alts. Yes, we know that you love to pull off that fat sound of a many-musician band. However, when the room is full of similarly-clad robots marching in line (if they move at all), who don’t respond when you talk to them, things get rather creepy and the immersion we look for is often ruined. Entertainers are very welcome! Just sign up with the hobbit hosting the event, preferably by a /tell. Note that we absolutely love solo bards/performers – a lone lute-player is often better suited for the inn setting than a huge band. Also note that we absolutely love other kinds of entertainment than music: Poems, stories, riddles, the latest news from the Shire… lovely! If you want to play music, it is grand if yer aim for a folksy hobbity vibe, with reels, jigs, waltzes, hornpipes and the likes. Gossip and news is very welcome! This helps bring life to the event and the roleplaying in the Shire. Just remember to keep things in-character. Related to events: We generally don’t advertise events held on other servers, events not of hobbit interest, events not held in the Shire or events not of a roleplaying character. Additionally, we ask that participants follow the roleplaying rules and policy for Laurelin, with regard to player names, chat behaviour and harassment. Lastly, while the above may sound like a long list of rules, don’t worry too much! Them hobbits are a friendly and tolerant lot, eager to welcome new visitors to the inn. See yer there! Contact: Lina, Grand Order of the Lost Mathom. When you attend Green Dragon Friday, send your warm thoughts to the first people enjoying the event back in May 2008. Not least the creator, Mae Skeffington, who fought hard to set it up and make it last over the years. That was a mighty fine initiative! Tall tales or short stories? The new year brings new things to the hobbit community! The Songburrow Story Club starts in early February! Hobbits love a good story, and you can hear many good ones at the Shire inns, told by gammers and other storytellers. But inns can be busy and loud sometimes, and some people prefer more peaceful places for storytelling. I am fond of stories, so I wanted to start a storytelling club in my home village, Songburrow. I would like to make this a recurring event (maybe a quarterly event), but that depends on how many folks are interested in participating, and how often. What happens at the Songburrow Story Club? The Songburrow Story Club is an open event for hobbits who love stories. You can either come as a storyteller or a listener – anyone is welcome. The meetings will be informal and relaxed, allowing folks to have free interaction with each other. However, we will have some special themes for each meeting – for example, I might ask folks to prepare a story or a poem beforehand on a particular topic. But all that is voluntary though – this is not the Homework Club, after all! Also, we might do some storytelling games, like a Round Robin Story. We might share some gossip as well. And of course, any stories and poems are welcome to this event, you don’t have to stick to the special theme nor make anything brand new for the meetings. The special themes serve merely as an inspiration for folks who’d like to write something new, but you can certainly divert from them and share something else too. 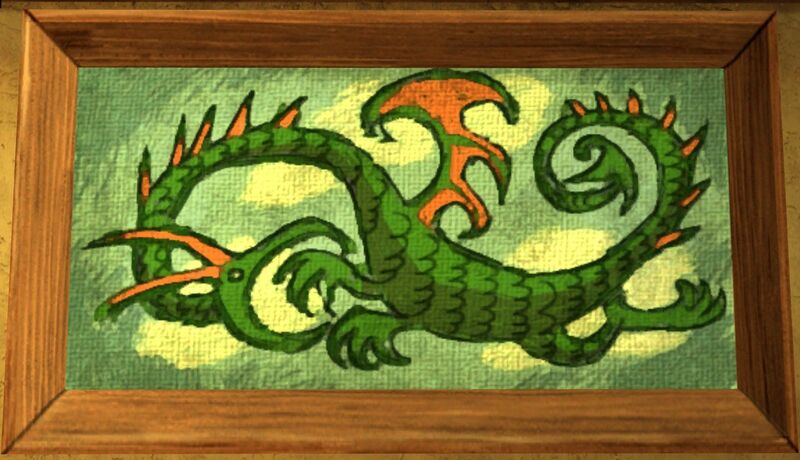 If you miss the meeting, you can always share your writings at the weekly Green Dragon Fridays where stories are very much welcome. Our first special topic is quite simple: a story from your childhood. You can either prepare a detailed story of something that happened in your childhood or just describe the case just in a few words. The others might have questions though, so be prepared to answer their queries if needed. It would be grand to learn more of our backgrounds. Maybe you took part in some mischief in your tweens? Maybe you had an odd neighbour who you feared as a small hobbit? Did your wild imagination lead you to unexpected adventures in your own neighbourhood? Share your childhood tale as a story, a poem or just with a few words! So, welcome all story lovers! I look forward to seeing many of you in February. Oh, and I will make sure that there will be pie for all. This is a roleplaying event for hobbits, although some travelling dwarves might also come and stop by. If you are a storyteller, you might find Simbo’s Poetical plugin useful. 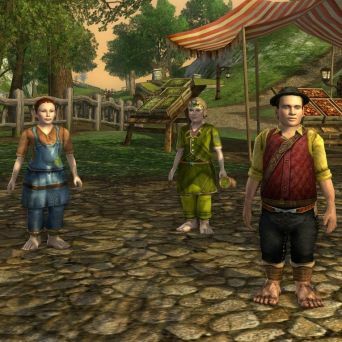 The main purpose of this event is to give us hobbits a chance to roleplay our characters, give folks inspiration to write creatively in the LOTRO setting and just have some relaxed fun together. Please keep the length of your stories reasonable – max 15 minutes telling your story in-game – so that one story won’t take the whole evening to tell. The event itself will last about 1–1,5 hours, depending how any stories we have. Welcome all hobbit roleplayers, both old and new! Winter is a grand time for coarse fishing and this year, we are honoured to be invited back to Northcotton Farm for our fifth Annual trout Tickle! As in previous years we shall be fishing for trout, with a special Golden Trout Award for the angler who nets the first Golden Trout. The last winner of this prestigious prize was Miss Nimelia in 2017. All levels are welcome however, and there will be a separate prize for those not yet versed in the art of Trout fishing. We at the Shire Angling Club have been working closely with Albin Northcotton to make sure the pond was ready for the match. A great deal of weed has been cleared and the pond restocked with many trout, of all species and hue. An exciting match is promised. For those new to the farm, follow the road up the hill to the left as you enter Oatbarton. Take the first gate on the left at the top of the hill, turn right after then second gate, then left after the third. The farm is at the top of the hill. No need to register, just turn up with warm clothing and your fishing gear.